The Annasaheb Chudaman Patil College of Engineering is one of the top-ranked deemed Engineering and Management college of Maharashtra established in 1992. Sprawled over 3-acre, the college grounds of Jawahar Education Society’s A C Patil College of Engineering recommends a prominent technical environment for the potential graduate & post-graduate students of engineering & management courses. The campus of ACPCE offers a sum total of 14 professional degrees in engineering & management including B. Tech/ B.E, M. Tech, and Ph.D. Courses. The institute is conveniently located near to Kharghar railway station, bus depot thus making it easier to reach the college without any hassle. The A.C. Patil College of Engineering is affiliated with the Mumbai University, Maharashtra. The courses of the private aided institute are recognized by the National Board of Accreditation (NBA). International and National technical associations like ISA, IETE, IEEE are actively associated with the placement cell of the college. The campus is enabling with its 214 faculty teaching staff for more than 2,400 undergraduates and postgraduates students. Build up area of the university grounds is expanded approximately 2,00,000 sq.ft. For past 20 years, it has performed and becoming a hub of eminent technical education. The Annasaheb Chudaman Patil College of Engineering initiates to develop the skilled professional environment for catering to the needs of industries. Apart from that, the college communicates to step up the learning attitude amongst students through extracurricular and co-curricular activities. The A.C. Patil College of Engineering passes out the quality educational surrounds to aspirants by providing them access to modern laboratories, sports & research services, library, gyming, and clubing facilities. The staff members of cafeteria strictly follow the rules of Hygiene and clean up the canteen area twice a day. 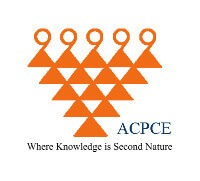 Numerous workshops and seminars on career scope of engineering and other management courses also organize by the ACPCE College. The Annasaheb Chudaman Patil College of Engineering offers various professional and technical courses for the pass out students of Class 12th. The sum total of 7 courses is considered under College of Engineering Department as follows. Eligibility: An applicant must be passed in HSC exam with PCM with at least 50% marks. The college offers various Post graduations course such as M.E, MCA, and MMS. Interested applicants of PG level must have passed B.E/ B. Tech degree in the relevant subject with at least 50% marks. B.Tech/BE in relevant discipline with minimum 50% marks. Any degree graduation with at least 50%. For M.E students will be selected on the basis of GATE score. For MCA course students will need to qualify the MAH-MCA-CET scorecard. For Master of Management Studies (MMS), applicants are selected on the basis of merit list drawn on the basis of marks in the qualifying exam and entrance. For MMS a valid CAT/ XAT or CMAT score card is mandatory. The minimum eligibility for appearing in B. E/ B. Tech course is an applicant must be passed his/her 10+2 or equivalent with Physics, Chemistry/ Biotechnology/ Biology, and Mathematics subjects with a minimum aggregate mark of 50% in Class 12th examination. Selection will be completed on the basis of MHT-CET or JEE Main exam. Students who get pass with a higher rank in these entrance exam will get a seat in the deemed college. Students of other states including Jammu & Kashmir will get seats on the basis of JEE Main score only. Note: apart from this, 20% seats will be filled through Management Quota. 5% of relaxation is offered to the SC/ ST category candidates in the qualifying examination. Only HSC and SSC exam pass out candidates of Maharashtra will be considered for the State level seats. Only candidates belonging to Maharashtra state can apply for the MHT-CET entrance test. Aspirants need to qualify his/her B.E/ B. Tech degree with a minimum 50 % mark. A compelling GATE score is necessary for enrolling in the M.E Course. Applicants who have passed the graduation degree from Maharashtra region will be allowed to apply for the State Level Seats. Students who want to take admission in MCA course need to complete his/her Bachelor’s degree with a minimum 50% mark in a relevant subject. The aspirant must have studied Mathematics as one of the main subjects in 10+2 or 10+2+3 level. A valid MAH-MCA-CET scorecard is compulsory in order to take admission in MCA. For MCA 45.5% seats are reserved for the candidates of Mumbai University Jurisdiction. Candidates are ready to pursue academics in MMS course simply need to complete his/her Bachelor’s degree with a minimum scorecard of 50% in a relevant subject. A valid CAT/ XAT or CMAT score card is compulsory to attain the admission in MMS. 20 % seats are filled through Management Quota and 15% seats of total intake are filled at All India level. Visit the official website of DTE to fill an application form. Start filling your details and upload the copies of required documents. Pay the application fees of ₹ 800 (for General and OBC) and ₹ 600 (for SC/ ST/ PWD Category candidates) through Credit Card, Debit Card, Net Banking, and other payment options. At last, take a print out of the application form for a further verification process. Go to the web portal of DTE Maharashtra. Register as a new applicant and obtain Login credentials at your verified email account. After this, start filling online applications for Centralized Admission Process. Pay the application fees of ₹ 1000 (for General, OBC, and students belonging to outside Maharashtra state) and ₹ 800 for other reserved categories. Payment will be done through Credit Card, Debit Card, Net Banking, and other payment options. Important Notes: Online application will be acknowledged only after the submission of hard copy of the application form with all relevant documents at the different centers of the college. The sum total of 85 % seats is reserved for the meritorious students of Maharashtra zone. Students of A.C. Patil College of Engineering will be placed at some reputed companies like MTNL, Siemens, VSNL, etc.